The XTENDEX DVI Extender transmits digital DVI video up to 150 feet away from a DVI source using two CAT5/5e/6 cables. 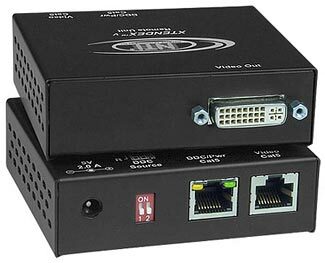 Each video extender consists of a local unit that connects to a DVI source and also supplies video to a local monitor, and a remote unit that connects to a monitor. Transmits single link DVI-D signal over two CAT5/5e/6 cables. Extends high digital resolution up to 1920x1200. Supports local and remote DVI monitors. Supports computers and video devices with single link digital DVI output. Female DVI-I dual link connector for computer connection. Female DVI-I dual link connector for local monitor. Crisp and clear 1024x768 resolution at 150 feet; higher resolution supported at shorter distances. Female DVI-I dual link connector for remote monitor. Remote unit: powered from local unit through CAT5/5e/6 cable. 2-meter male-to-male single link DVI-D cable included.